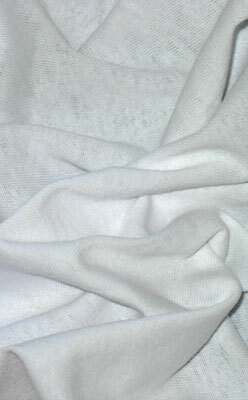 Cotton Jersey PFD 60" $4.45 3.96 $3.56/yd. Jersey is a knitted very slightly stretchy fabric with a smooth flat face and a more textured but uniform back. It is what basic t-shirts are made of. This one is a nice weight, with a very usable width of 60". Suggested usage; custom made over sized tops and tees, costuming, theater draperies, sportswear, skirts and dresses fabric sculpture (fabric wrapped and pulled over infrastructure, then painted with gesso) etc. very comfortable stretch to the fabric takes dyes great but needs to be washed a few times to get a softer jersey feel. straight out of the bag its a little scratchy easily remedied however. HAVE PURCHASED THIS TYPE OF FABRIC FOR YRS. THE ONE YOU SELL IS A VERY GOOD QUALITY NOT SOAKED IN STARCHES SO IT SHRINKS TOO MUCH & THE FINISHED FABRIC ENDS UP WITH A NICE CLOSE WEAVE OF GOOD QUALITY. Not bad cotton single knit - somewhat coarse better after washing - takes the dye fine - did shrink up after the initial wash maybe a couple of inches per yard so wash before cutting. Wish Dharma would also carry a combed single cotton knit. The content of this review must be approved by the moderator before it can be displayed. I LOVE this jersey. I've made 7 dresses 4 jackets 5 skirts and 2 pairs of pants. They've worn well and held their shape for the last 2 years. The fabric takes well to the Procion dyes. Good not at all flimsy great value. I will definitely buy this again. Rather stiff and edges roll way too much.Hard to work with. Would not order again. Amazing quality especially at this price. I've been unable to find this weight of dyeable cotton jersey ANYwhere else in the US. I am so glad you sell it. It's incredibly comfortable for garments and dyes nicely. Yay! Cotton is as described. It is a great price. Only reason for taking off one star is that this cotton is not very soft but for the price and how well it dyes I am very happy.